Memento is Christopher Nolan's second outing and is based off of a short story his brother Jonathan wrote entitled "Memento Mori" At its core, the film is a revenge tale set in Los Angeles. One of those "you took everything I had, so now I will take everything you have" sort of films. With a twist or thirty-seven that alters everything you have ever thought about that genre. 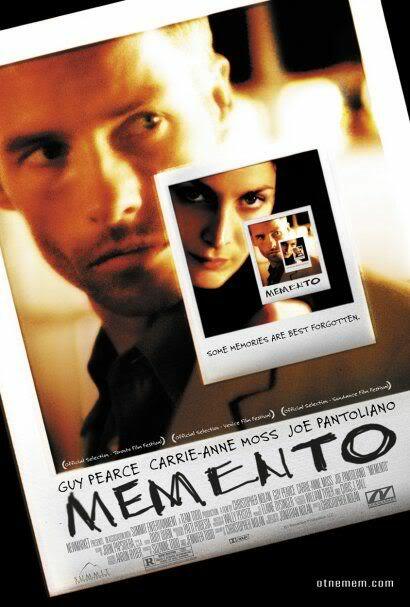 Structurally, Memento is backwards in the most literal sense of the word. The movie starts at the end of the events and ends at the beginning of them. You're going to need to pay attention to this film VERY carefully if you want to get the most out of it and you will be exhausted and probably a little depressed at the end. Luckily, the film's use of short vignettes explaining the events ease you in and take it easy to begin with. Repetition make Leonard's life possible and repetition makes our understanding of the film possible as well. Characters are introduced as new time and time again and lines of dialog are repeated throughout the movie, with characters stating that Leonard tells the same story about a man named "Sammy Jankis" everytime they come in contact. The dialog is also heavily thematic with people talking about how everything is "backwards" and how memories are unreliable, only facts can convey truth. Like all of Nolan's "protagonists" Leonard is searching not only for revenge, but for atonement. He is a man looking for a sense of purpose, but cannot remember what that purpose is. He exists out of time and describes his condition as like "waking" everytime he forgets it's like starting anew and refreshed. Everyone has a clean slate with Leonard when they first meet, but just because he can't remember, his cohorts can and that's when things get complicated. Leonard lives in a world with no accountability and is allowed to literally get away with murder several times. It's in these scenes that our heart is wrenched out of our chest as we see him being manipulated into channeling his regret and revenge into innocent people. Yes, most of the people he kills are criminals, but is that how justice needs to be served? The film culminates in his getting revenge on the man manipulating him into these situations to begin with, but only because Leonard thinks he is the one that killed his wife. Memento is a masterwork in storytelling and will be dissected and inspected for years to come. And this is only the second film of Christopher Nolan's career. It is truly impressive that ANYONE pulled this off, let alone a second time director. Also, the 2-disc edition of the DVD has a special feature that allows you to re-construct the film to see it chronologically, If you haven't seen this cut of the film, DO IT. It is more than worth it.